If your child likes Sesame Street and games then you should check out this Elmo Hide & Seek Board Game. The Sesame Street board game bring a talking Elmo that can be hidden and then your child can try to find it and as Elmo can talk (you can turn that off) it will gives some hint to the kids. 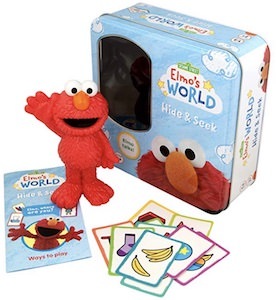 You can play this Elmo hide and seek game in 3 different version and one uses the include cards to make you choose where to hide it. 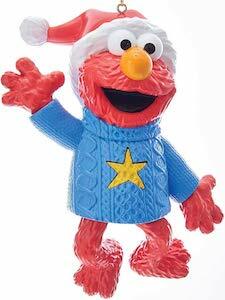 Kids young and old will love finding Elmo and after playing you can keep Elmo out so that he can be part of your world. 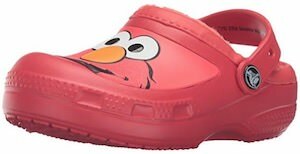 If you want your child to wear shoes and they like Elmo then you should check out these fun kids Elmo Crocs. The Sesame Street shoes are red and lined so that you child will have warm feet and has fun shoes because they have Elmo on the front and they can put it on themselves. You can get these Elmo shoes in many kids sizes so that many kids from ages 1 – 8 can wear these fun Sesame Street shoes. Now you can stop worrying about putting shoes on your kid because now they can do it themselves and that is fun for both of you. 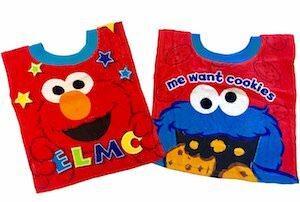 If you have a baby then you know 1 bid is not enough and that is why you want this Elmo and Cookie Monster bib set as it is two fun bibs that are perfect for your little one. The Sesame Street bibs are made from 100% cotton and machine washable. both bibs are red and on one you will find Elmo holding his own name and the other bib shows Cookie Monster eating a cookie and above him it says “Me Want Cookies”. So make you child know to to the world of Sesame Street and they will love the fun characters and everything they have to teach. If you are looking for some fun underwear to bring out the romance then you have to see these Elmo boxers shorts. This men’s underwear is black and covered in red lines hearts and on the front, you can also find some white hearts and behind one, you can find Elmo. On the back of this underwear, it says “Be Mine!” and Elmo can be found on those letters too. Now you can have fun underwear for Valentine’s Day or any other day you want to surprise someone. 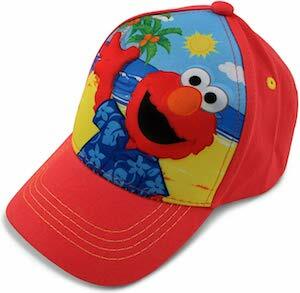 You can get this Sesame Street underwear in men’s sizes Small – XL (28 – 42) and they are made from 100% cotton. Now you can have a Elmo face pillow! This Sesame Street pillow is round and looks like the face of Elmo and not only do you have Elmo on the front but you can also find him on the back of this adorable pillow. The Elmo pillow is red of course and has the famous face of this Sesame Street star on it and it is always smiling at you. 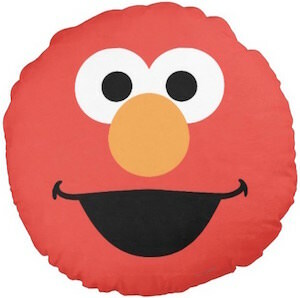 Just imagine this pillow on the bed or a chair in your child’s room or of course in yours because Elmo is for all ages and he is always happy to see you. 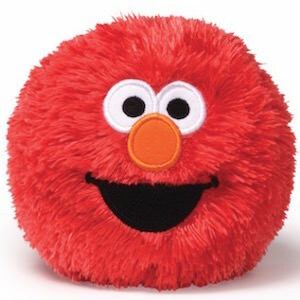 We all know that Elmo is furry and red but now there is a ball version of Elmo that even the littlest once of us can enjoy. 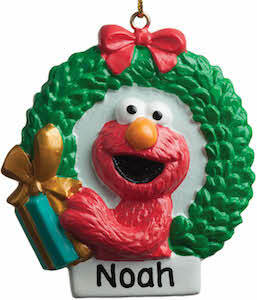 This is a plush 4 inch ball that is red of course and has an embroidered face that makes it look just like Elmo. And when you roll Elmo around he giggles and that of course will be super fun for the little kids and maybe even us adults. The Sesame Street Elmo plush is made by Gund so you know that it is a quality products and the Elmo giggle ball is even machine washable.